As 2013 comes to an end, the time has come to put the finishing touches to this blog..
Could Jesus be buried in Srinigar? At the end of the last post, I hinted that next installment would be about the winding road to Leh. But I really couldn’t leave Srinigar without mentioning our visit to the place where Jesus is buried. Yes, you read that correctly. Jesus is said to be entombed in Srinigar, India. The minute I read that astounding fact in the guide book, I knew I just had to check it out. Our second morning on the houseboat, after another Ramandan-interupted night’s sleep, Paula and I decided to go explore the city. Leaving the calm of the lake behind us we entered the throes of this uneasy town. Our driver brought us to see the various mosques. At one we were obliged to wear thoroughly unbecoming grey sacks to cover our lady curves. We were not altogether amused as the menfolk continued to eye us up nonetheless. When we announced our desire to visit Jesus’ tomb, pointing it out in the guidebook, our driver enquired as to whether we were absolutely sure that we wanted to go there. He seemed a bit uneasy. Apparently tourists are not altogether welcome at this place. We insisted and he dropped us at a distance from the tomb. When we found it, workers who had been making repairs to the building were locking up to go for lunch. They looked at us shiftily. We were not allowed in and they pointed at a large sign which instructed visitors not to take photographs. Even after they left, we didn’t dare take out our cameras. The photo here is from a friend’s blog. It was quiet except for the Ramadam prayers being said from the mosque beside us. The two young girls with pigtails playing in the street who smiled and giggled at us seemed incongruous. We peered though gaps in the shuttered windows, catching glimpses of two cloth-covered stone tombs. Was Jesus buried there? How intriguing. Given the air of mystery, the desire to keep tourists away, I can only think that there’s a very strong possibility that he is. Yesterday marked my two-month anniversary of returning to Ireland from India. It has taken a while to adjust. At first, although wonderful to reunite with family and friends, everything seemed a little “too much”. While the recession continues to reign strong here, to the eyes of someone who had just spent 10 months in a much less well-off country, the abundance is astounding. Living one of Dublin’s leafy suburbs, shiny cars abound in driveways and flat-screen TVs glow in the sitting rooms of almost every house as the dusk settles. How could anyone complain of lack when the evidence of wealth is seemingly so plenty? But inevitably, bit by bit, that sentiment ebbs and one becomes accustomed Western-style living. But I have not forgotten India. I miss it daily. I sometimes find myself day-dreaming that I am back in Goa, diving into the powerful, warm waves of the Indian Ocean, while the orange sun slowly dips down into the horizon, or that I am in the Himalayas, preparing to meditate in a beautiful Tibetan Gompa amongst robe-clad sangha. I even miss the daily assault on the senses that India can be – the people, the smells, the noises…even the bathroom facilities in all their various states (!) The challenges that India offers the average traveller, even one that stays on the very much “beaten track” carved out by decades of Lonely Planet travellers, made me feel truly alive. 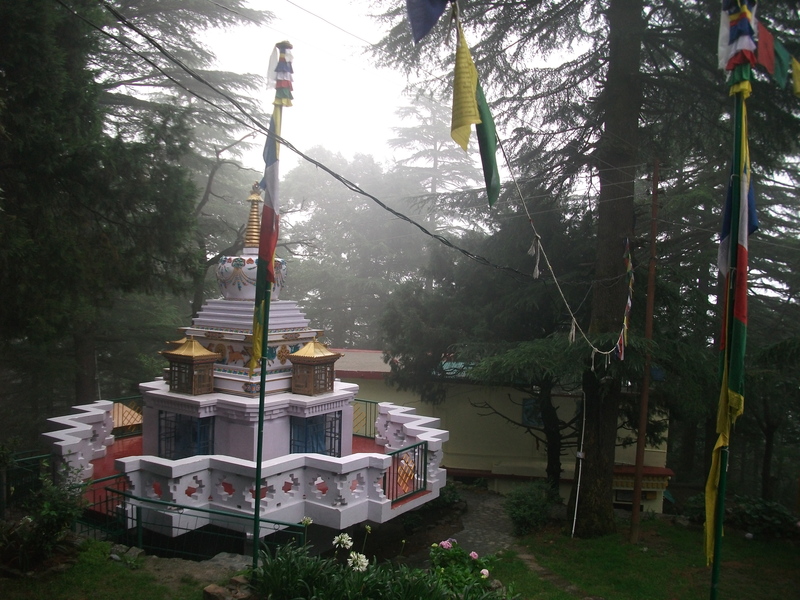 In July I wrote about my time volunteering in McLeod Ganj. During those six weeks in McLeod, I made a plethora of new friends from all over. Towards the end of the month, as the monsoon embraced the mountains and the damp pervaded for days on end, causing mould to appear on everything from camera cases to shoes, four of us finally packed our bags and struck out for higher ground. The weather, we had been told, further North was far warmer. We decided to first go to Srinagar to stay on a house boat and then carry on up to Leh, far up in the mountains of Northern India. We arranged a jeep to bring us from McLeod to Srinagar. Best way to negotiate a 12 hour trip, we thought. A luxurious alternative to the public bus. But it was not to be. Although leg space was aplenty, peace and quiet for the overnight journey was wishful thinking. It was Ramadam at the time and our driver played devotional tunes from the moment we began our journey to its (somewhat bitter) end. Even an IPod at full volume could not drown the driver’s music out. None of us had the heart to tell him to turn it down or even turn it off however. It was evident to us all that this man had not had his full quota of sleep in the preceding days and was reliant on cigarettes and singing along with the soundtrack to keep him alert. As the road to Srinagar was of the windy, dark variety, populated with unscrupulous Pakistani trucks, we decided to hold our whist. Arriving in Srinagar we were greeted on the quays of Dahl lake by our extremely affable host, Youssef, proprietor of the “Houseboat Neelam”. We were ferried across to our lodgings on one of the lake’s quaint “shikims” which operate as water taxis. We were unsure what to expect, but were delighted when we entered a beautifully old-fashioned houseboat, with a deck to sit on, sitting room, dining room and two en-suite bedrooms. The furnishings were quaint – thick carpets on the floor, red velvet chaise longue in the sitting room and porcelain crockery reminiscent of what you might find at your grandmothers’ house. Youssef served us a copious breakfast, complete with cardamom-infused Kashmiri tea. Contentment reigned. Youssef inherited the houseboat from his father, who had been a cook in an Embassy in Delhi. He lives in another house beside the boat with his wife, his mother-in-law and his 9 year old daughter. His was an arranged marriage. He feels that his parents chose well for him. He’s almost 40 now and he’s happy with his life. He certainly made us feel very welcome during our four-day stay, after which we set out to Leh, but that my friends, is a story for the next instalment…. I meet Dolma for the first time in the library of the LHA office in McLeod Ganj. She is sitting with Tenzin, the volunteer coordinator, and rises as I come in. She has long dark hair and is dressed in skinny jeans. Although a little shy in her demeanor, her smile is broad and warm. She greets me in lilting English and I realise that my job as her English tutor is going to easier then I imagined. She wonders if we can work on her pronunciation and selects a teenage murder-mystery book from the library to read from, before guiding me to a nearby rooftop café. 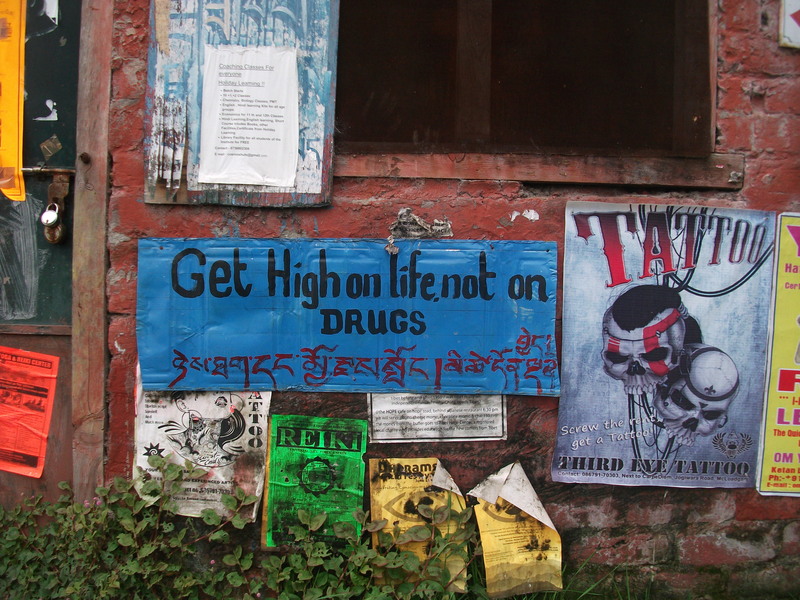 There we sit on red plastic chairs and drink masala chai, surrounded by young Tibetans enjoying banana lassies and monks indulging in chocolate muffins. 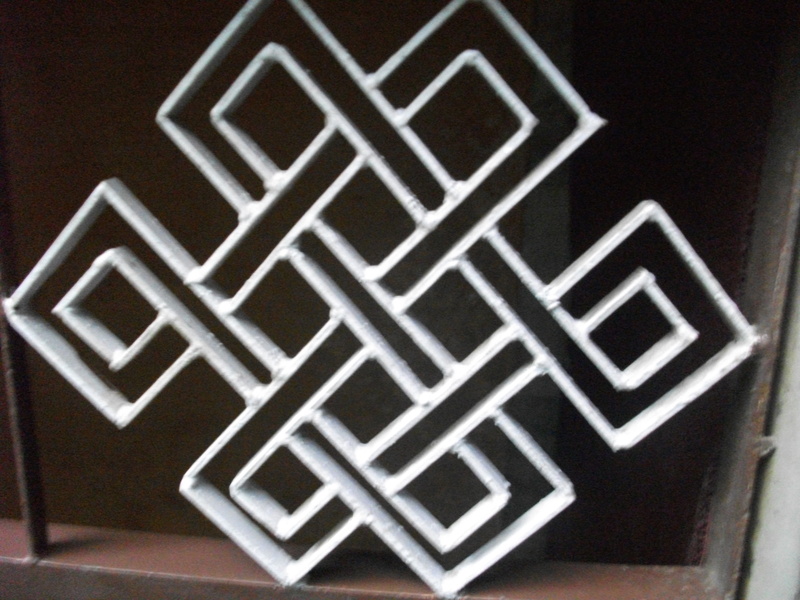 Several people I met in India had recommended volunteering with LHA, an organisation for Tibetan refugees. The experience was highly positive from the word go. On-line registration was seamless and when I made my first appearance at the office, both Tenzin and the other volunteer coordinator, Bob, were incredibly helpful. Bob quickly pulled my details from the database and within a day, Tenzin had put Dolma and I in contact. It really couldn’t have been any easier. As with many volunteering experiences, I had the feeling from the start that I was gaining more than I was giving. During our time together, we worked hard on pronunciation and discussed the idiosyncrasies of English grammar and spelling. Sometimes we even lapsed into French vocabulary-learning, as Dolma is studying French too. But in between, we chatted, and Dolma told me about her life. 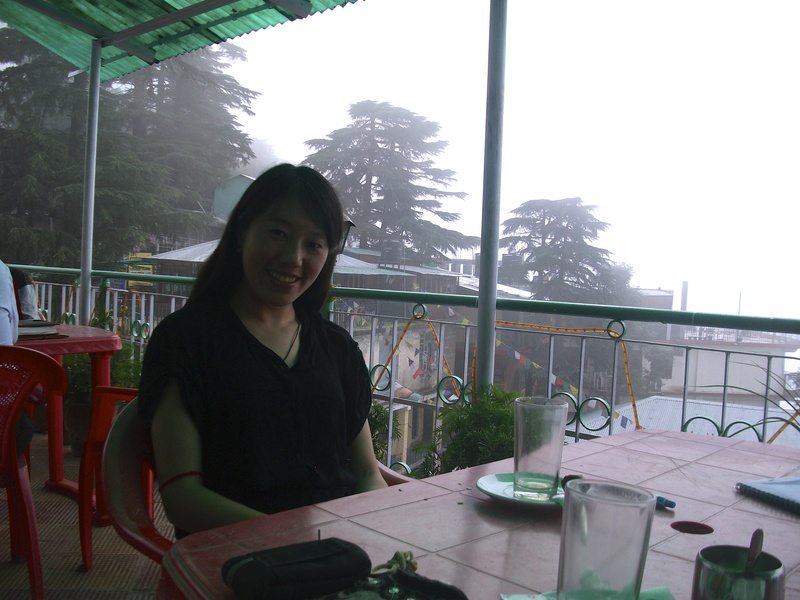 I was fascinated to hear about her escape from Tibet and how she had come to be in McLeod Ganj. She told me also about Tibet and gave me insights into Buddhist practices. Dolma escaped from Tibet three years ago when she was 19, along with her sister Lalo, who is a year younger. Their father had to pay 40,000 Yuan (about 5,000 euro) to a guide to bring them out of the country. A huge sum of money for a farming family. The journey began when they set out from their village to Lhassa by bus. They then hid in a canned goods van in order to cross the border. From there, they walked for three nights in the dark with only a torch to guide them. The first night was the most dangerous. If the Chinese were to catch them, they would be put into prison. Eventually, they reached Nepal and went to stay with an uncle in Kathmandu. There, using her knowledge of Chinese, Dolma found work. She helped her uncle with the administration of his business and taught Chinese to Nepali business men. The money was good, but she yearned to continue her schooling while also helping the Tibetan community. And so she and her sister came to Dharmasala. They both attended school and when Dolma graduated, she began working as a volunteer teacher at LHA, teaching Chinese to her fellow Tibetans. 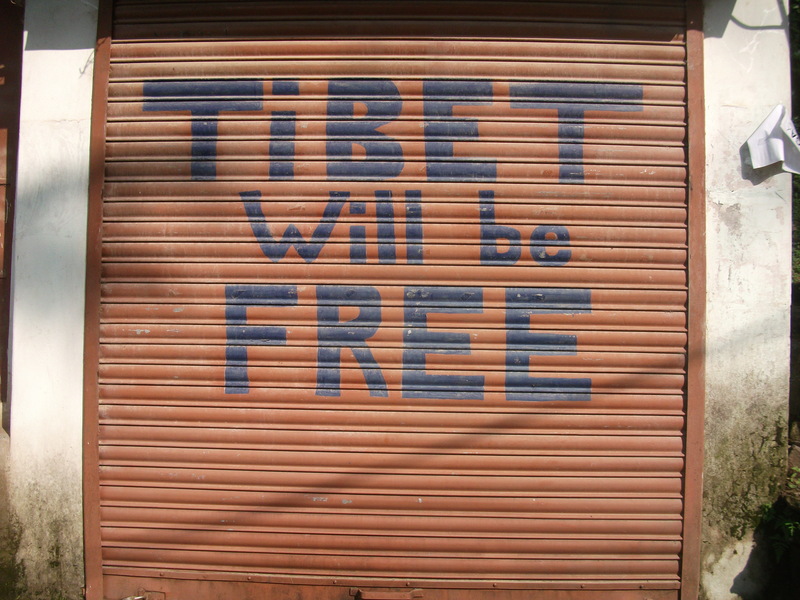 Knowledge of Chinese allows Tibetans to return to their home country and live and work there. Without the language, they are outcasts. The classic story of the occupied country. Being Irish, I could certainly relate to it. Dolma’s days are busy. She teaches, she helps out in the kitchen of the restaurant owned by the Tibetan family she lodges with, and she studies English and French. Once a week she meets with a monk who is teaching her to write Tibetan. She can speak standard Tibetan, but she never had the chance to learn how to write it when she lived in Tibet. Everything she learnt was through Chinese. But the most important time of the day for Dolma is first thing in the morning, when she goes to the main temple in order to do her prostrations to Lord Buddha. One morning I joined Dolma there. Arriving at 6.30am, I found that she was still practicing. I sat on a bench while I waited for her. In the main gompa, monks were chanting and blowing trumpets. A mystical sound. All around the exterior of the gompa, on two levels, others of all ages completed their prostrations also – bringing their hands, in prayer position, to the crown of their heads, mouth and throat and then bowing down in order to slide their bodies full length on wooden boards. When Dolma finally joined me, she showed me the number on her pink prostration-counter which she wore on her finger. She was out of breath, which was no wonder: she had completed 236 prostrations. It was hard not to be impressed with the level of her devotion. Dolma says that she wanted to be a policewoman when she was little. She would have enjoyed sorting out problems. But she soon realised that would not be possible, so now she has set her sights on being a translator. She rarely gets to speak to her family, as a regular call from India could arouse Chinese suspicions, but when she does, they always tell her to come home if she is not happy. She says that she doesn’t have any close friends in McLeod, but feels that she does not need them. She has her younger sister, and besides, she is happy with her life for now– learning languages and helping her compatriots to learn Chinese. She would like to get married one day, but she is in no hurry. On the day before I leave McLeod and head for Kashmir, Dolma and I meet for a final lesson. She is relaxed with me now and squeezes my arm as she wipes a black smudge off my cheek. She wishes me well on my travels and wonders if I have any friends with whom she could practice her English. Foreigners never seem to stay very long. She is happy when I tell her I’ve passed her number on to a couple of fellow travellers. We embrace as we go our separate ways and promise to meet some day in the future when she comes to visit Paris…perhaps under the Eiffel Tower. A while ago a received an email from a lady called Suzi Richer who is running a campaign to restore a Buddhist monastery in the villlage of Langtang. I was in Langtang back in May and was saddened to see this monastery in such a bad state. I know it would a lot to both the locals and the tourists who visit to have it restored to its former glory. If you have a love of Nepal, its culture and its people, and 6 quid or so to spare (the price of a bottle of wine, as Suzi so aptly puts it! ), then it would be very gratefully received by Suzi and the rest of her team. The campaign runs until the end of this month, so time is of the essence! Can you spare £6? The price of a bottle of wine? We’re asking 2666 people to give just £6 to help repair this 600 year-old monastery in Nepal. Please help us if you are able to. We need your help to raise £16,000 in 60 days to save the Langtang monastery in this remote Himalayan village in Nepal, near the Tibetan border. This historic monastery is the heart of the whole community. It is now in need of emergency repair and restoration. The Langtang community have raised a staggering £20,000 so far (the average annual income in the village is only £825) – they need our help to raise the final £16,000. Please share this poster/link/blog post – the more people we can reach, the better our chances of reaching our goal. One morning during the meditation retreat at Tushita, Richard, our meditation teacher, announced that instead of our usual afternoon session, we’d be taking a walk to the nearby woods to meet a monk friend of his who has been in retreat for twenty years. So after lunch, armed with rain macs and umbrellas, our group of sixty-four novice meditators, plus John the Cork man from the kitchen, set off down the fairly muddy path from Tushita into the forest. The retreat area was dotted with small tin-roofed wooden houses. About forty monks live here. As we entered it, Richard gave us a lesson on some Tibetan traditions. 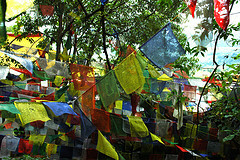 Multi-coloured prayer flags in red, yellow and white swayed in the trees at its entrance. Richard explained that the literal translation from Tibetan for prayer flags is “wind horses”, which is why there are horses depicted on them. It is the job of these horses to bring the mantras to heaven. As we moved on, Richard advised us to add a stone to each of the stone-heaps which we passed. This is to appease the spirits living there. Apparently this is a tradition which comes from high up in the Tibetan mountains where the spirits play a strong role in lives of people living there. While we waited for Richards’ friend to arrive, we circumabulated the retreat area’s stupa, noticing that there was some good quality whiskey amongst the offerings. Was this a case of “spirit for the spirits”, we wondered. 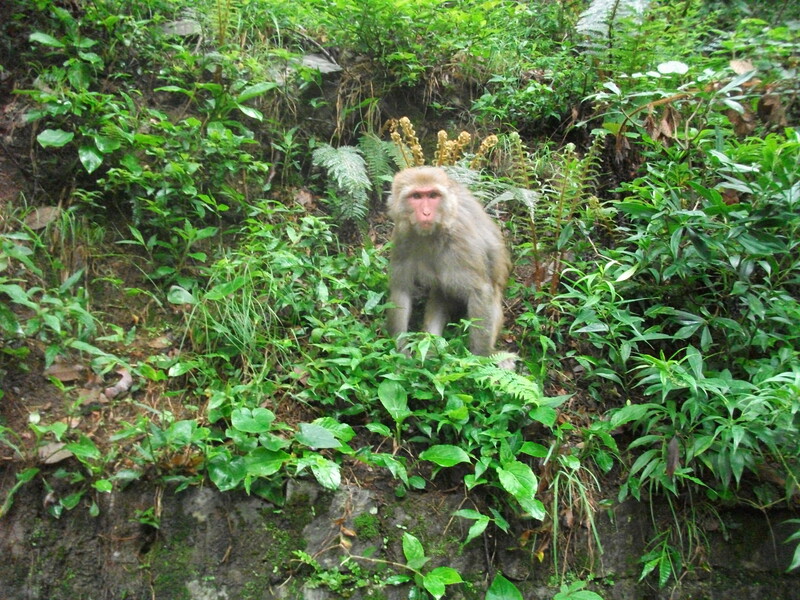 Soon the monk ambled up to the clearing in which we stood in. He wore maroon and saffron robes. A maroon blanket was wrapped around his shoulders to ward off the damp air. His black hair was shaved close to his head and he wore round glasses which echoed his round face. His feet were clad in sensible brown leather lace-up shoes. A little incongruously, he wore Lacoste socks. The crocodile labels were attached upside down however. In his hands, he held a large multi-coloured umbrella. He smiled at us and asked whether we had any questions. He seemed more than happy to tell us about his day to day life, his reasons for becoming a monk and his meditation practices. Most of his day is spent in meditation, he told us. He eats just one meal a day. He doesn’t need much to live. Clothes last a long time. Sometimes he just needs a little money to travel in order to see his family in the south of India. Tushita provides the monks in the retreat area with a small stipend and he supplements this with donations which he receives. He spends most of his time alone and in silence. From time to time he and the other monks come together to meditate. His strict routine is only broken during the colder months of the year when he leaves the forest to the warmer climes of the South. Sometimes he goes into McLeod Ganj. It is very busy there, with lots of noisy tourists and honking traffic, but he says that this does not bother him. It would seem that he is a good example of a calm and equinanimous mind. 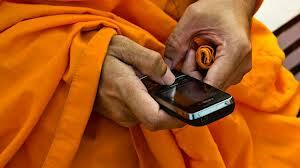 Although he lives a reclusive life, he still considers himself a 21st Century monk. He owns a mobile phone and even has a Facebook account to keep in touch with friends and family. He became a monk when he was nine. At the age of seven, he knew that he wanted to join the monastery as he thought that it looked like an easy life, but his parents were reticent to let him go. Finally, they gave into his pleas and he spent 14 years there., before then coming to live in the forest. Both of his brothers are also monks and his sister is a nun. He thinks that being a monk is a good life and he is very happy with it. When asked about his meditation practices, he admitted that like us, he found it challenging to focus his mind in the beginning. He giggled as he described how he would fall asleep at times when he first started practicing. We could relate to that and laughed with him. He would not reveal however whether he had experienced emptiness or whether he had had any other realisations. This is not the way it works. Such things are only revealed to those who are ready for them. When the question and answer session had reached its conclusion, the monk smiled at us broadly and gave us a little bow before returning to his wooden house. He seemed serene, at peace with himself and the world. A true example of how it is possible to live a very simple life in a pure state of happiness while seeking out the ultimate Buddhist goal – enlightenment. 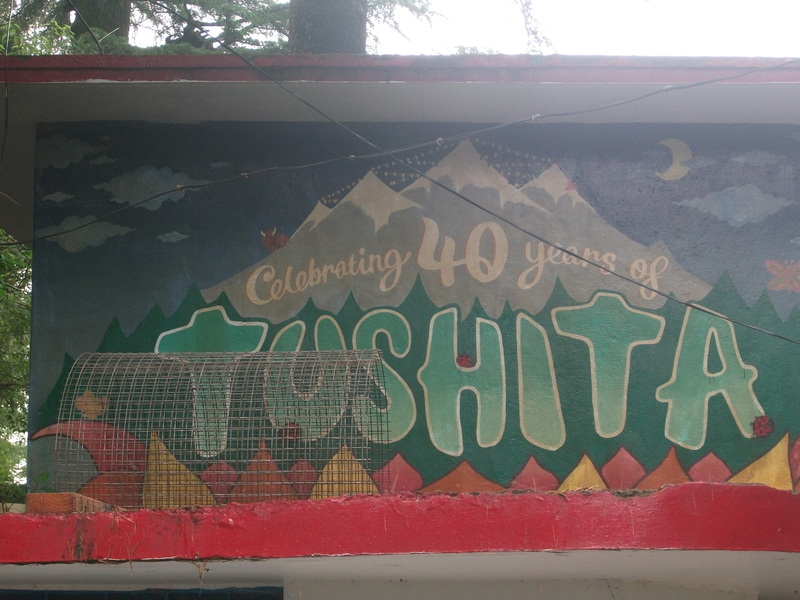 It’s hard to know whether the best part of spending time at the Tushita Buddhist meditation centre in Dharamkot are the culinary delights which the kitchen provides in the form of lashings of peanut butter spread on tasty freshly-baked white rolls, flavoursome veggie curries and sometimes even pizza, or the visual entertainment of the resident tribe of monkeys who spend their time hanging out of the prayer flags or playing in the monkey pool, plotting their next assault on the dining hall. Following the Dalai Lama teachings, I had booked onto the 10 day “Introduction to Buddhism” course that is run at Tushita. 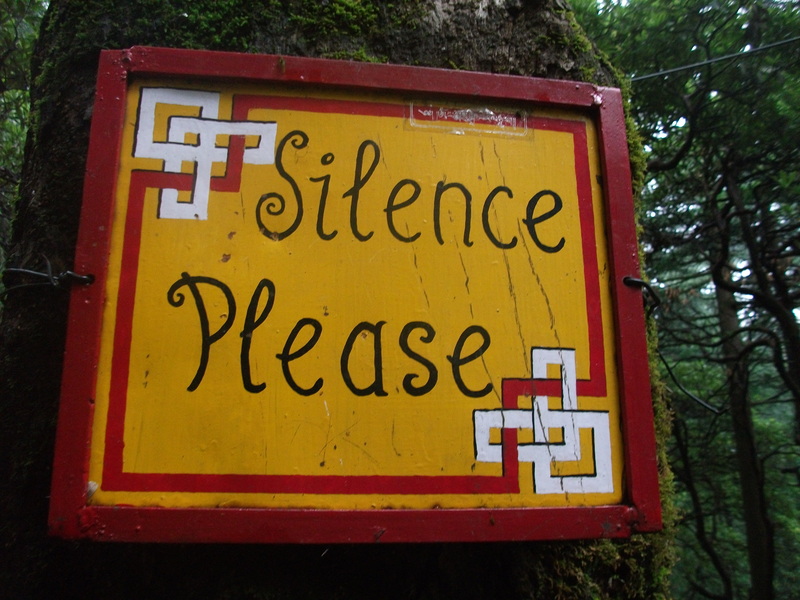 Like the Vipassana course in Kathmandu, it was to be another 10 days in silence. To be honest, I was looking forward to a bit of peace and quiet again after the hectic atmosphere of McLeod Ganj, so I packed my bag once again, jumped into a rickshaw and headed further up into the hills. Our days in Tushita began and ended with guided meditation and teachings in Buddhist philosophy, an hour-long discussion group and a “stretching” session in between. In comparison to the Vipassana schedule (which kicks off each day at 4am), the 6.45am start, the chance for an hour-long chat in the discussion group every day, access to a well-stocked library, not to mention the delicious food, it felt to me a bit like being at a Buddhist holiday camp. Our philosophy teacher was a nun by the name of Sarah. She had left England after university to travel, and while in Kathmandu happened upon the Kopan Monastery where she began to learn about Buddhism. By the time she was 22, she had taken her vows. Over the 10 days, Venerable Sarah imparted her knowledge great deftness and humour. By the end we probably knew as much as the average Tibetan Buddhist about the Buddha’s teachings. A great feat indeed. 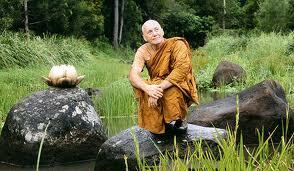 Richard, our Dutch meditation teacher was a Vipassana meditator for 6 years before he came to Tibetan Buddhism. At first I wondered what caused him to change. I really appreciated the “bare bones” approach of Goenka’s Vipassana teachings when I first learnt about them in Kathmandu. Tibetan Buddhism by comparison seemed “flouncy” to me. The colours and decoration of the “Gompa” (meditation hall) where we sat was bright and playful and its texts talked of there being 6 different “realms” where beings could live, “Hungry Ghosts” and “Dakinis”, a type of female oracle. It all felt a little bit too close to Catholicism (the very thing I was looking to distance myself from), with its talk of purgatory, original sin and other stories from the Old Testament. Before Tushita, I found myself turning more and more to Buddhism as a path as it seemed to have a purity and simplicity that other religions lacked. Never had a war been waged in the name of the Buddha, never would a Buddhist so much as think of trying to convert anyone. Its philosophy of practicing loving kindness and compassion to all as a path to living a more conscious life and by doing so perhaps even attaining the mythical state of “Samadhi”, otherwise known as enlightenment was very appealing to me. Buddhism is all of those things, but I was surprised and saddened to discover that corruption and abuse exists even within its confines. During our discussion group, I discovered that older monks in the monasteries have been found to have abused the young monks; lamas, especially from the Tantric traditions, have been known to dupe their students into sexual relationships. At first I felt I bit sickened. But as we learnt more, I began to realise that being a Buddhist doesn’t absolve anyone from being unkind or committing abuses. It simply lays out some precepts by which one should try to live and it is up to each person to live by them as best they can. By the end of the 10 days, I felt that I had expanded my mind and found a path that I could completely relate to and wanted to apply myself fully. Despite my initial reticence to the frills of Tibetan Buddhism, I had come to terms with it, realising that I could take from it what felt right for me. As Richard put it, Tibetan Buddhism is a bit like a supermarket, you can check out its shelves and only put in your basket what you really feels right to you. I’m still grappling with some of the concepts and at the end of the day, having grown up a Catholic, those traditions will always be with me and part of me (the urge to make the sign of the cross sometimes when trying to cross a particularly busy road in an Indian city is at times just too strong! ), but there are certain things at this store which feel right for my life right now which have gone into my basket and I’m taking them home with me. I know they’ll be of use now and in the future.